As we get past the halfway point in seasonal anime, productions get messier and the information regarding upcoming staff featured in anime magazines becomes scarce – more often than not, schedules are so messy that it’s impossible to provide detailed staff lists in advance! That won’t stop us from sharing all the available details however, just so that you’re ready for the upcoming episodes with the highest potential. My Hero Academia: To the surprise of no one, HeroAca has developed something of a staff rotation. The episode 17 (S2 #4) team consisting of storyboard artist Kou Matsuo plus animation directors Kazumi Inadome and Yoshiyuki Ito is returning for episode 21 (S2 #8). However, Satoshi Takafuji – director of the first OVA – will be taking Takuhiro Kadochi’s place as the episode director this time around. Episode 22 will be handled by #16’s duo of storyboard artist Shinji Ishihira and episode director Hitomi Ezoe. Animation direction will be in hands of episode 18’s Takashi Mitani, joined by the show’s prop designer Takaaki Izumo and regular animator Minami Sakura. As you can see, a tight team of recurring artists. The real highlight is coming the week after that, though! For the first time since the very first episode of the show, character designer Yoshihiko Umakoshi will be directly in charge of the animation direction. He’s been continuously involved with the show as the chief animation director, but as the supervisor he will be more directly in charge of the drawing quality; chances are he will oversee many more, if not all, of the animation cuts. This hints at the importance of episode 23 (S2 #10), and it’s no coincidence it shares the “Name: Origin” title pattern with the debut episode. This may even be the episode where FX animation aficionado Takashi Hashimoto steps in as effects animation director! He also mentioned that a certain amazing animator worked with him, and you know who that might be. Shinji Sato will be tasked with the storyboard this time around, a name whom Naruto fans may recognise. Episode direction will be in hands of episode 14 (S2 #1) and 18 (S2 #5)’s Setsumu Dogawa. Consider me excited! The Eccentric Family 2: To a certain degree, at this point Uchouten operates under the rule of no news being good news. All upcoming episodes will be storyboarded by the not-so-mysterious entity Team P.A commanded by the series director Masayuki Yoshihara, and that is more exciting than if change were to happen. The lineup of directors and people supervising the animation is perfectly familiar as well, which means that the upcoming highlights – such as episodes 8 and 9, directed and co-directed by Heo Jong respectively – are also hardly a surprise. Its staff is progressively getting messier as you would expect, but it’s impressive how a dedicated crew has held it together so well. Pokemon Sun and Moon: You know what, no words. Granblue Fantasy: Kazuhiro Miwa’s breathtaking work on episode 5 still resides fresh in my memory. Not much time has passed since then, yet it’s already time for him to possibly overwhelm us with his skills once again. 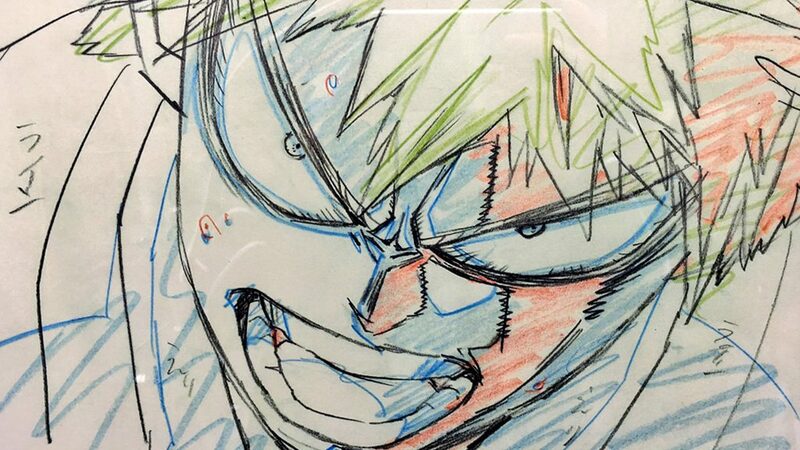 He’s handling part of the animation direction workload on episode 8, which will be storyboarded by Kiyotaka Ohata – the director mainly known for his playful Azumanga Daioh and Working!! openings. You can check his OP/ED works in this compilation on nicovideo. He’s not quite as striking when it comes to storyboarding action scenes as episode 5’s Takahiro Miura is, but I’m sure we can look forward to Miwa’s animation in any form! Tiger Mask W: Toei’s rising star Haruka Kamatani will return to direct episode 32, once again ready to show off her skill. She will be accompanied by the show’s trustworthy character designer Hisashi Kagawa and action expert Ryo Onishi on the animation front, meaning this will be without a doubt one of the most climactic moments in the whole series. The lineup is also indicative of the understandable deterioration of the production schedule after 3 cours, however; Kamatani had been graciously granted a full cours between episodes and given full control over them before, but this time she returns earlier and won’t even handle the storyboard. The series was by all means well planned by Toei standards, but after over 30 episodes things inevitably get messier. Eromanga-sensei: Mags provided absolutely no useful information for Eromanga, but there have been rumours circulating regarding the possibility of Shin Wakabayashi being in charge of episode direction for episode 8. While not quite a superstar when it comes to directional work, he does provide his outstanding animation for episodes he handles more often than not. Within a show filled with outbursts of charismatic acting, his presence seems quite fitting. Do take this with a grain of salt, though. Sources this close to the creators are typically trustworthy, but it can’t hurt to be a little bit skeptical! Wow that is lovely title image there.